Remove the ignition coil(s). Refer toIgnition Coil Replacement - Bank 1and/orIgnition Coil Replacement - Bank 2. Warning:Refer toSafety Glasses and Compressed Air Warning. Caution:Clean the spark plug recess area before removing the sparkplug. Failure to do so could result in engine damage because ofdirt or foreign material entering the cylinder head, or by thecontamination of the cylinder head threads. The contaminatedthreads may prevent the proper seating of the new plug. Use athread chaser to clean the threads of any contamination. Use compressed air in order to remove debris from the spark plug cavity. 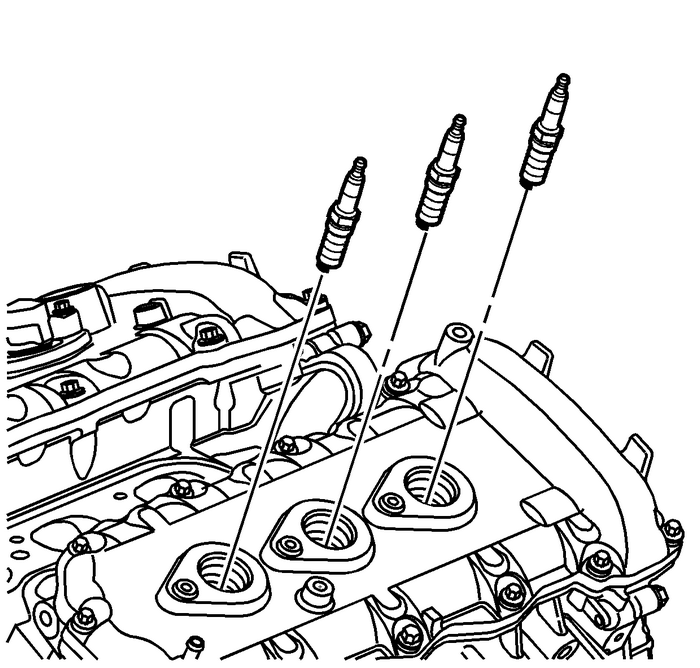 Caution:Allow the engine to cool before removing the spark plugs.Attempting to remove the spark plugs from a hot engine may causethe plug threads to seize, causing damage to cylinder headthreads. Caution:Use only the spark plugs specified for use in the vehicle. Donot install spark plugs that are either hotter or colder than thosespecified for the vehicle. Installing spark plugs of another typecan severely damage the engine. Caution:Check the gap of all new and reconditioned spark plugs beforeinstallation. The pre-set gaps may have changed during handling.Use a round feeler gauge to ensure an accurate check. Installingthe spark plugs with the wrong gap can cause poor engineperformance and may even damage the engine. Ensure that the spark plug gap is equivalent to the spark plug gap specification.Refer toIgnition System Specifications. Caution:Be sure that the spark plug threads smoothly into thecylinder head and the spark plug is fully seated. Use a threadchaser, if necessary, to clean threads in the cylinder head.Cross-threading or failing to fully seat the spark plug can causeoverheating of the plug, exhaust blow-by, or thread damage. Install the spark plug and tighten to 18-Y (13-lb-ft)..Install the ignition coil(s). Refer toIgnition Coil Replacement - Bank 1and/orIgnition Coil Replacement - Bank 2.